Paint with essential benefit: Organically cross-linked nano-quartz particles form a compact, mineral-hard, three-dimensional quartz matrix structure against soiling and keep façades clean for a longer period. The special silicone resin/binder combination enables water-repellent, highly water vapour permeable paint coatings on exterior renders/plasters and mineral substrates. Also suitable for renovation of adherent silicate paints, matt dispersion/emulsion paints or synthetic renders/plasters and stable external thermal insulation composite systems (ETICS/EWI). 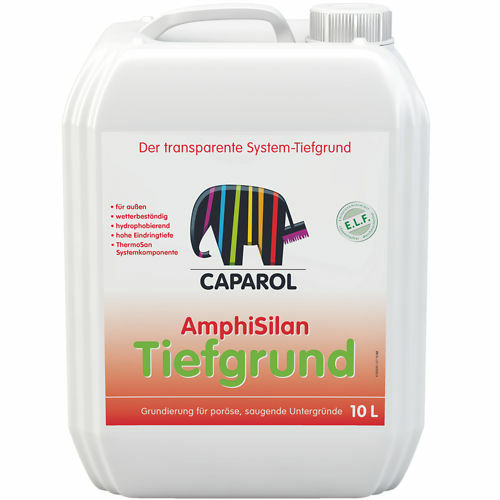 AmphiSilan combines the advantages of approved emulsion paints and classic silicate paints. These properties make AmphiSilan an ideal choice for coatings on listed buildings and calcareous renders/plasters. Low surface tension, no thermo-plasticity, non-film-forming, micro-porous. Forms a capillary active dry zone. Permeable to CO2 Resistant to aggressive air pollutants. Contains special pigments with photocatalytic effect. Minimises the risk of localised flatting of additives. Reduces noticeable marks on dark colours which may occur on mechanically stressed surfaces. Combined silicone resin emulsion and new hybrid binder, on an organic/inorganic basis.